French-Palestinian lawyer and human rights activist Salah Hamouri is still waiting on a decision from a higher Israeli court after prosecutors appealed a judge’s order for him to be imprisoned for three months instead of six months without charge or trial under administrative detention. On 13 September, the Israeli high court judge ruled that his decision on Hamouri’s sentence will be presented in the Jerusalem district court at the beginning of the next week, without specifying the day. Earlier, the ruling had been scheduled for 14 September. Hamouri, a field researcher at Addameer Prisoner Support and Human Rights Association who just passed the Palestinian bar examination to practice as a lawyer three days before he was seized by Israeli forces, is a former Palestinian prisoner who was released in 2011 under the Wafa al-Ahrar prisoner exchange. He has been subject to ongoing harassment by the Israeli occupation, including being barred from entering the West Bank, delaying his law school classes. His pregnant French wife, Elsa Lefort, was denied entry and is now banned from Palestine. On 23 August, armed Israeli forces invaded Hamouri’s Jerusalem home in a pre-dawn raid. He was shortly thereafter ordered to administrative detention without charge or trial – almost immediately after he had initially been ordered released on bail. For Jerusalemite Palestinians like Hamouri, administrative detention orders must be issued directly by the ultra-right racist Defense Minister Avigdor Lieberman. The six-month order is indefinitely renewable. There are currently nearly 500 Palestinians jailed without charge or trial under administrative detention on the pretext of a “secret file.” Many Palestinians have spent years at a time jailed under administrative detention orders. His arrest was met with a growing outcry in Palestine, France and internationally, as Hamouri is not only personally known and beloved to many but an international spokesperson for the Palestinian cause and, in particular, the struggle of Palestinian prisoners. 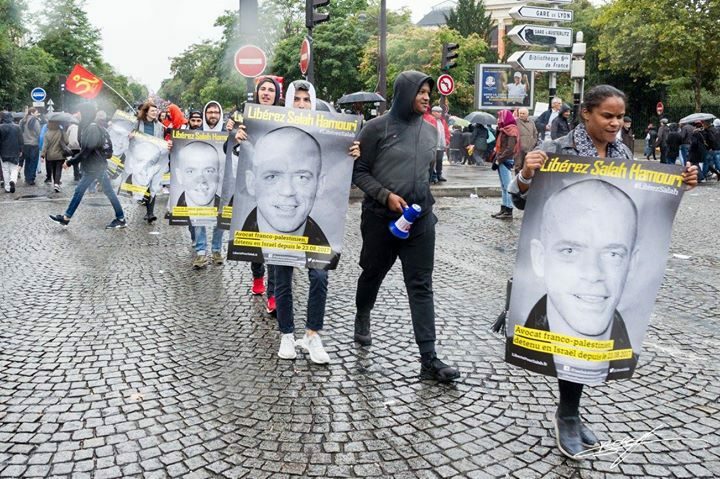 He has spoken on campuses across Europe and at the World Social Forum in Brazil, as well as at many large events across France, including the annual Fete de l’Humanite, on the situation of Palestinian prisoners seeking freedom. Across France, prominent politicians, trade unionists and activists urged the French government to take a stand for Hamouri, a French-Palestinian citizen. 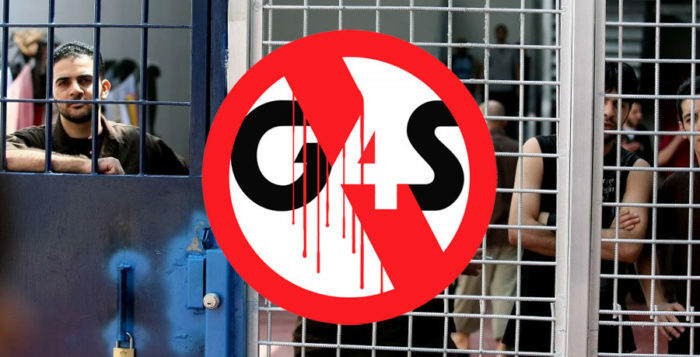 On 5 September, an Israeli judge ordered Hamouri sentenced to three months in prison – the remainder of his sentence when he was released in the 2011 exchange – rather than the six month administrative detention order. Addameer, the campaign for his freedom, his family, Samidoun and many other organizations denounced this sentence as an attempt to legitimize Hamouri’s detention while maintaining the same repressive threat. However, the Israeli prosecution appealed the sentence in order to demand that the six-month administrative detention order be imposed. The high court has now postponed its ruling until next week. Protests are continuing for Hamouri’s release. 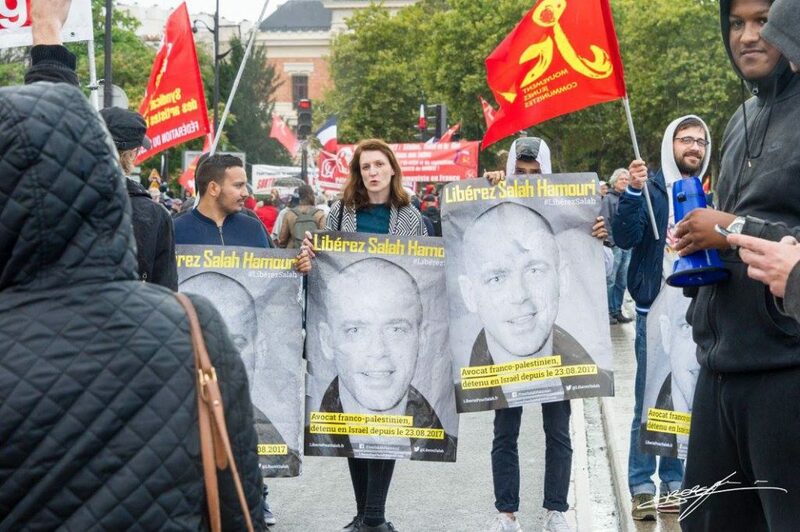 Contingents in protests in Paris against the state of emergency and proposed labor law changes demanded freedom for Hamouri, while this years Fete de l’Humanite will feature numerous events highlighting Hamouri’s case. “I want to tell you about a 32-year-old man. He is a French-Palestinian citizen, lives in Jerusalem and has just become a lawyer. A few days after he graduated as a lawyer, he was arrested on 23 August for no reason. And after a lot of dithering of the Israeli justice, like thousands of Palestinians he has been placed in administrative detention, apparently on the basis of a secret file, because it is totally empty. His name is Salah Hamouri. This reveals the relentlessness and total lack of respect for the law by a state that is constantly proclaiming itself one of our closest partners. Our External Action Service can not let this go and must demand the release of Salah Hamouri without condition and without delay. It is high time for the European Union to put the issue of fundamental rights and respect for international law and conventions as a condition for its cooperation with the State of Israel, as it does with so many other States. Samidoun Palestinian Prisoner Solidarity Network reiterates its urgent demand for the immediate release of Salah Hamouri and all Palestinian prisoners and call for the French state to defend the rights of their citizen and take action for Salah Hamouri’s freedom. It is no less critical now; it must be made clear that it is unacceptable to imprison Hamouri – or any other Palestinian – without charge or trial. This is clearly an attempt on the part of the Israeli state to target an effective, local and international human rights defender working for Palestinian freedom. 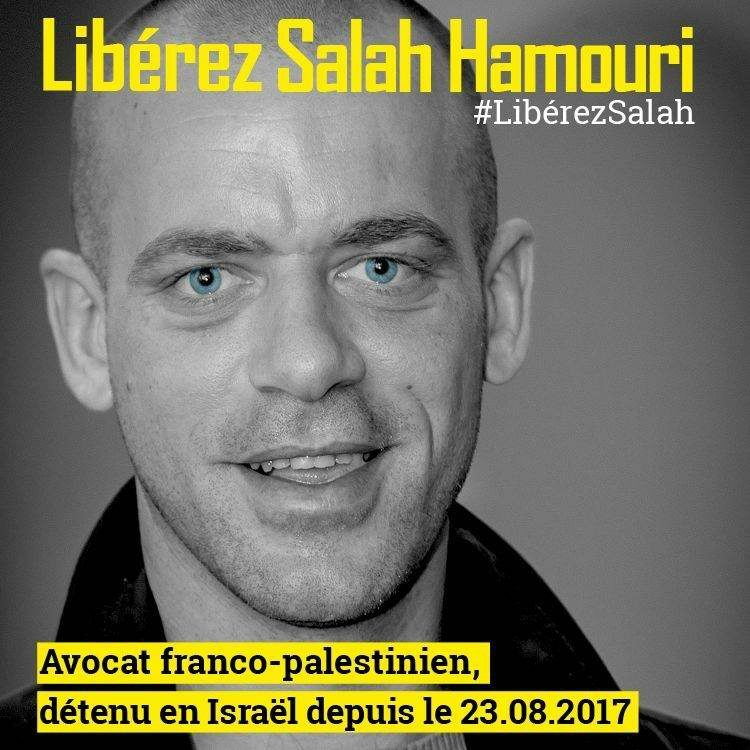 The French state must take real action to demand freedom for Salah Hamouri, the Palestinian human rights defender. From the jails and the courts of the occupation to the cities and campuses of the world, he is a consistent and clear voice against oppression and for liberation. Free Salah Hamouri! Libérez Salah Hamouri!